The focus from some was on the first part of the quote, where Atkins said they felt like they could start the season with the outfielders they have. While he goes on to say they do want to upgrade, it was the first half that drew the most attention and the most ire from fans. Given the state of the Jays outfield, that reaction is understandable. There are no stars in this bunch and not much in the way of established regulars. Kevin Pillar is probably the best of them and that’s not a great spot for a team that has designs on contending. Pillar is a fine defender in centre field, but has established himself as a below average hitter at this point. Ezequiel Carrera’s career year still had him just under 1 WARP in 131 games, Steve Pearce hits well, defends poorly and can’t stay healthy, and Teoscar Hernandez, while a solid prospect, was deemed expendable by the World Series champion Astros. There are warts to be found here. Assuming no upgrades (or that new Jay Yangervis Solarte won’t play the outfield for the first time since 2014), could the Jays enter the season with the outfield they have? Could they succeed? Let’s look at some scenarios where they could live, or even thrive, with the outfielders they have currently. Even if Teoscar Hernandez wasn’t the brightest light in the Astros system, he was still a worthwhile prospect close to the major leagues – something the Blue Jays didn’t have a lot of when they acquired him. There were concerns: not fast enough to play centre field, not enough of a bat to play the corner, and he struck out a lot. But, again, the Jays weren’t in a position to be choosy. That they got an actual prospect for Francisco Liriano was amazing enough. 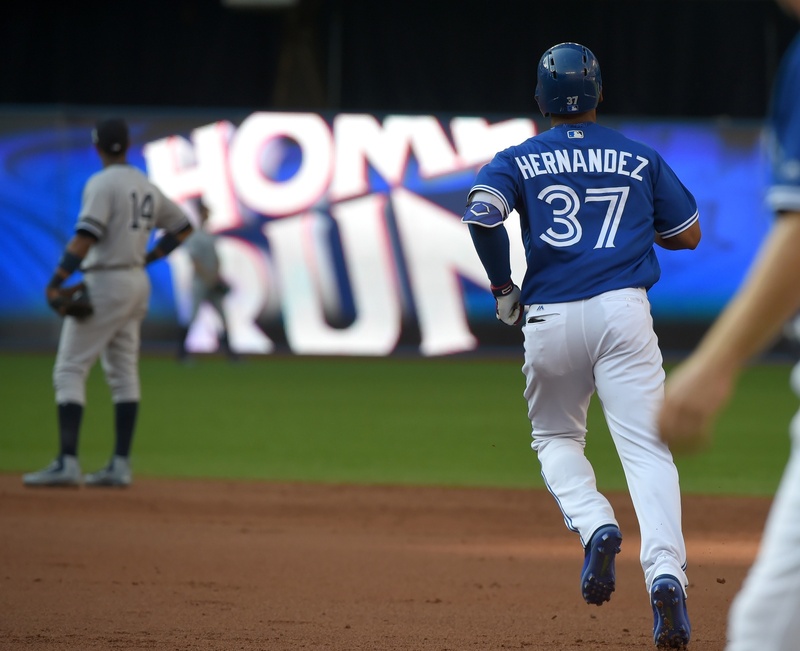 Hernandez had a solid showing for the Jays after being called up late in the season, hitting 8 home runs in just 95 at-bats. He did strike out 36 times, a concerning number for that amount of at-bats. And there’s the old adage about not believing anything you see in April and September. Still, Hernandez is mostly a blank slate at the major league level, someone on whom the Jays can project hope and see the potential for something greater than what he’s shown so far. He COULD be a star. He could also struggle, as some prospects do in the their first actual shot at the majors. There’s a wide range of possible outcomes. The other point to make is that Hernandez would essentially be replacing Jose Bautista. On the whole, it’s unlikely that Hernandez will ever get close to Bautista’s accomplishments in his career as a Blue Jay. But the 2017 version of Jose Bautista had an awful season, with a stat line of .203/.308/.366, good for a tAV of only .237. That’s not a terribly high bar to clear. So we can say that Hernandez, given a wide open space in the lineup, could easily be better than the man he’s replacing. He could be a star. But what if he scuffles? What if he bounces between the majors and AAA? How else could the Jays outfield work as it is? There’s very little exciting about a potential Carrera/Pearce platoon in left field. But it could be worse. The 2017 Jays opened the season with both Carrera AND Pearce in the lineup. The theory was that Pearce would split his time between first base and left field and Carrera would start some in left while backing up in centre and right. We know how that went: Pearce got hurt, Justin Smoak became an all-star, and Carrera had a career year. Carrera and Pearce are known quantities to Jays fans by this point, but that can be a good thing. They do have some contrasting skills. Pearce provides some right-handed power. Carrera bats left-handed, makes some contact, gets on base, and doesn’t completely embarrass himself in the field. There’s an easy platoon in that. And it’s not as if the Jays need a lot from the left field position. 2 WARP would have been good enough for 16th in baseball among left fielders last season and Carrera and Pearce combined for nearly that between them. So while it’s unlikely that Carrera or Pearce will suddenly find another gear, it’s not as if the Jays need them to be that much better. This is the most likely scenario. When the Jays’ lineup was a juggernaut in 2015, mauling opponents night in and night out, it was at least in part due to the depth of the lineup. Bautista, Edwin Encarnacion, and Josh Donaldson were the headliners, but them being great made it easier for the supporting cast to contribute. And when October rolled around, having the depth they had made it easier for them to carry the bat of someone like Ryan Goins, who hit only in theory during that playoff run. When we look at the Jays’ potential 2017 lineup, there are a lot of hitters. Donaldson and Smoak are the headliners, with Devon Travis and Russell Martin still able to bring value with the bat. Troy Tulowitzki is a question mark, and Kendrys Morales may have disappointed last season, but there’s pedigree in those names as guys who have been good previously and could potentially be that good again. Another help for the lineup: the Jays are better insulated against injury. The acquisitions of Aledmys Diaz and Yangervis Solarte give them better depth if someone gets hurt again. There will be no more seeing Darwin Barney and Ryan Goins anchor the bottom of the order. Solarte could even be an outfield option, having spent time there in 2014. So there’s a lot of ways the Jays could well stand pat with what they have and be fine in 2017. While the current outfield situation isn’t ideal, the Jays aren’t short of options. Ross Atkins is absolutely right: while the Jays should look to upgrade, they could absolutely start the season with what they have and be fine. Solarte also played a game in LF during 2017 WBC.